Meet the cruise at Pier 69 bright and early in the morning in the heart of downtown Seattle and relax as you travel in comfort and style to Victoria. 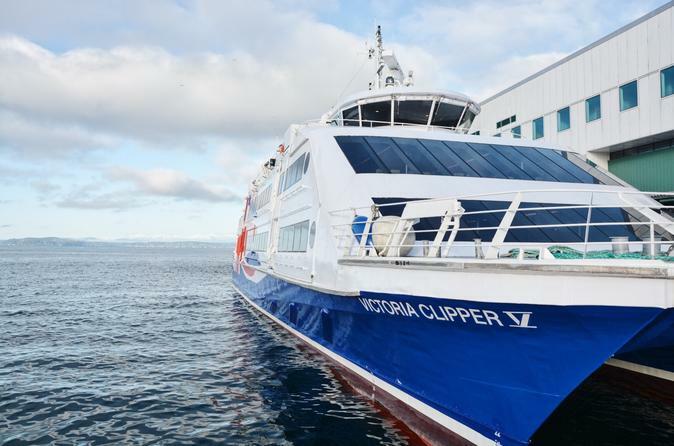 Enjoy a 3-hour cruise through Puget Sound and into the Strait of Juan de Fuca on your way to Victoria's Inner Harbor. Wide, roomy and comfortable seats provide ample leg room, making your trip easy and relaxing. Some seats have tables so you can enjoy onboard meal baskets or a refreshing beverage right at your seat (meals and beverages are not included). Pass the time by shopping at the onboard duty-free gift shop for gifts, luxuries and souvenirs. Or step out on deck and observe the beauty of the passing scenery. The friendly crew will answer all your questions and help you in any way they can. You will dock at Victoria's Inner Harbor - right in the heart of downtown Victoria. This convenient docking area gives you the freedom to start exploring Victoria on your own the minute your step off the boat. Return to the boat 1-hour prior to departure and enjoy a beautiful cruise back to Seattle.